While the Sixers have featured some of the best players in the history of the NBA, perhaps none had as much of an influence on and a tie to the city as much as Allen Iverson. His career in Philadelphia is legendary not only for his greatness on the court but also for the way he embraced the City of Brotherly Love. The 2001 NBA MVP and 11-time All-Star had his number retired, entered the Basketball Hall of Fame in 2016 and is now one of a unique group of athletes to be honoured with a “Tegata.” Iverson is the latest in a short line of great athletes to be honoured with a unique autographed Upper Deck Authenticated “Tegata” memorabilia piece. Utilizing handmade Japanese Hamada paper, Iverson has inked his right hand in black and included an authentic Inkan stamp which aligns with the traditional craft. 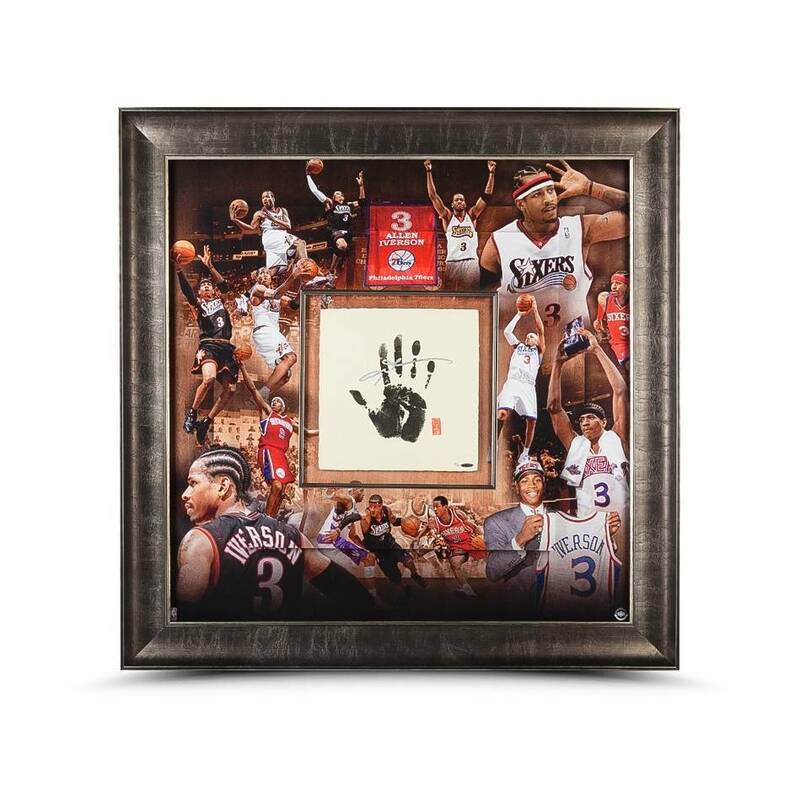 The overall keepsake includes a 12" by 12" inset center upon which Iverson’s hand has been inked and is surrounded by a double-matted collage-style background of his great Sixers career. To celebrate his induction into the Hall of Fame in the same year we released his portfolio, UDA produced this Tegata that is slightly larger than our other Tegata pieces. The Iverson Tegata measures 42” x 42” as a final framed size. Iverson performed the “Tegata” process under supervision of UDA officials and helped in the hand-crafting of 30 uniquely authentic stamps for the debut release. The limited-edition (30) silver autographed hand print is guaranteed authentic by virtue of Upper Deck Authenticated’s Five-Step Authentication Process.